Telecoms operator Openreach (BT) has today begun trials of a “new” civil engineering technique called “Micro Ducting“, which in some areas could be used to speed up the roll-out of their new Gigabit capable Fibre-to-the-Premises (FTTP) broadband ISP technology to UK homes and businesses. The trial was first hinted at as part of a story we ran on 10th January 2019 (here), which covered the operator’s decision to remove a batch of new 35ft tall telegraph poles after their erection caused anger among the residents of Armstrong Avenue in the suburbs of Exeter (Devon). At the time very little was known about this trial except that it had been developed in Germany. Last week a relative (credits to Adi) of somebody living on the avenue was kind enough to pass us a copy of Openreach’s latest letter about the works, which described the trial as being a “UK first” that would take place between 13th and 20th February 2019. A total of 35 properties on the avenue are due to benefit. 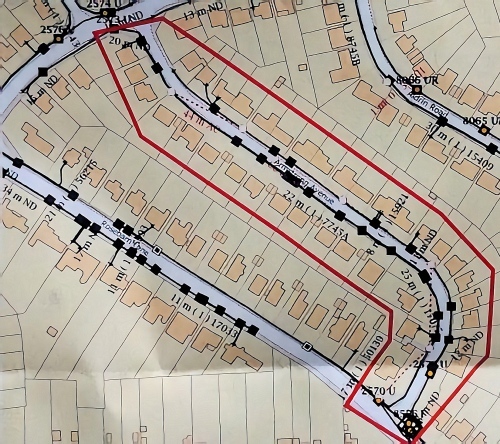 Openreach will be trialling a new micro duct system in order to provide a fibre cable to the land immediately surrounding your property (technically known as the ‘curtilage’). The purpose of the trial is to establish whether this system would be a practical solution to provide properties which currently have a copper cable feed directly buried in the ground (like yours) with a direct fibre feed. These works will involve excavating a small trench along the pavements and installing a micro duct and a small access box (the size of a water meter cover). All work will be completed in small sections to minimise impact and will be carried out by a specialist Openreach team. On the surface (no pun intended) Micro Ducting sounds an awful lot like the much more familiar Micro Trenching (aka – Slot-Cutting) method of civil engineering, where a shallow and narrow trench is dug at speed into the pavement for new cables using specialist machinery. Indeed Openreach has confirmed to us that the two approaches are not radically different, barring a few changes. Historically large cable ducts with internal diameters around 100mm were used to contain a mix of copper and fibre cables, yet building these was often a slow, disruptive and expensive process. By comparison the more familiar Micro Trenching method can save considerable time in deployment, as well as using fewer resources, reducing environmental impact (i.e. less waste removed from trenches or transported to the site for backfill). In the past we’ve seen Micro Trenching where an operator has laid conduits into a slot-cut trench of less than 20mm wide and between 120-300mm deep. 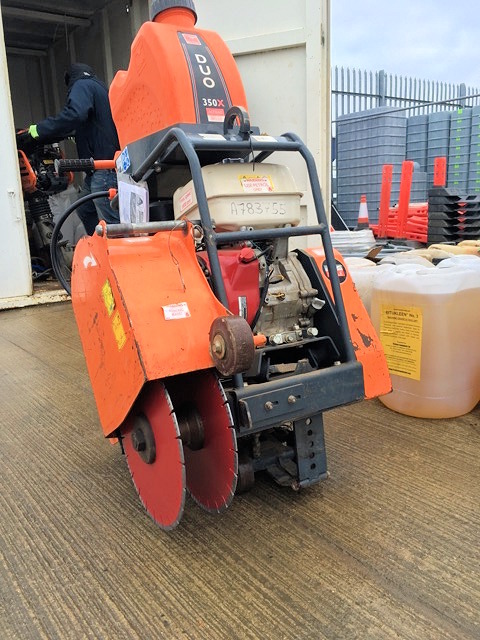 Meanwhile Openreach’s team will be using specialist kit to dig in via a twin saw so that both sides of the channel can be cut at the same time; this process cuts a narrow trench about 4 inches wide (100mm) and to about 250mm depth or below. 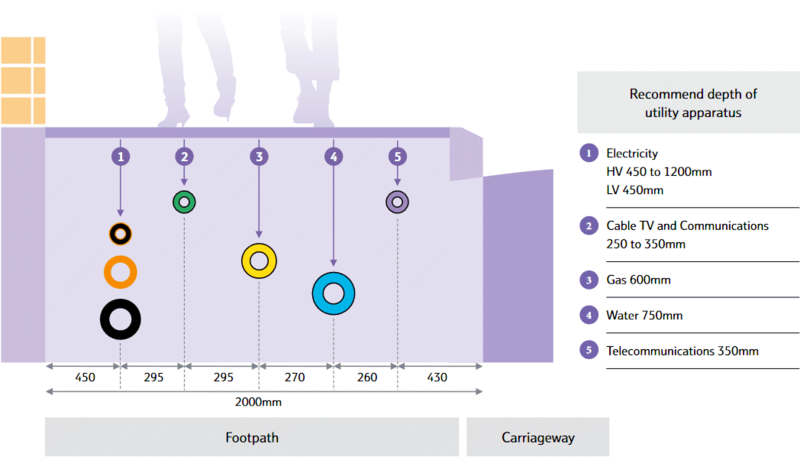 Just for some context, here’s an Openreach illustration of how deep different ducts usually go (TV/comms networks tend to be around 250-350mm). One key difference with Openreach’s method is that the fibre cable can be pushed down the micro-duct rather than having to be blown (often cheaper) and the kit works with their existing connectorized fibre. The silicon lined micro-ducting is also armoured (comes in 3m sections) because it needs to be robust enough to go direct into the ground. The downside of pushing cables is that you can’t reach as far as the blown method, although an earlier pilot has shown that Openreach could push the cable up to a distance of 80-100m. The “slippery fish” cables they use (a 2-fibre small profile oval cross-sectional cable of 8x4mm) are quite rigid and strong enough to be pushed over that distance without bending or snagging. They’re also small enough to clip onto poles or slip behind other cables or trunking. At the time of writing we haven’t been able to get any detail on comparative costings from Openreach, although more traditional / older methods of civil engineering were known to cost in the order of £75-125 per metre and a single gang would typically complete 30-50m a day. By comparison even older styles of Micro Trenching used approximately one hundredth of the material needed to backfill the trench and, where the technique is appropriate, typical costs were in the order of £10-15 per metre and a single gang could complete 150-200m per day. At this stage we don’t know how fast Openreach can go with Micro Ducting and trial itself may go slower for the purpose of learning. Likewise the size of the trench makes us think that Micro Ducting may be more expensive than c.£10-15 per metre via Micro Trenching, but we’ll probably only know for sure if it leaves the trial phase. Openreach informs us that the trial will last for a month (just deployment takes a week) and then they’ll collect the data, which will be used to decide whether there’s a business case to continue with it. Apparently they’re only trialling this in areas that do not have existing infrastructure, which we assume means FTTP since Armstrong Avenue does have cables (e.g. Virgin Media) that will need to be very carefully avoided. Otherwise the operator is currently building in Exeter at a rate of 500 homes passed per week and they’ve already covered 10,000 since the work began. Openreach are using a 36 fibre cable for Exeter but with this method they could use up to 144 fibres, not that this is an issue since every fibre can support 32 FTTP connections. In addition, the operator has informed us that they’re also testing Micro Ducting on a deployment to 160 premises in Ashford, Kent. Now here’s a picture of the machine they’re using. We’ve had some pictures of the local engineering work, which shows quite a bit of disruption and the use of the word “micro” is being called a bit into question with those trench sizes. This will be a game changer if it takes off. Hasn’t Google in the US just abandoned micro trenching recently and called it a failure? Yes and I recall reading that the lines were “popping up out of the road all over the place,” so they must have had contractors that weren’t doing a proper job with the backfill, cable type or depth. Louisville does also suffer from mild earthquakes now and then, which is not ideal for such deployments. But this is of course why you conduct trials, to learn what works and what doesn’t first. I think in the USA Google were only digging the cable via “Nano trenching” to about 50mm deep, although they did use some “micro trenching” too but I’m not 100% sure which part went wrong as some of the reporting seems to confuse the two methods. One thing is certain, at 250mm you shouldn’t ever be seeing lines “popping up out of the road” so I think the fault was with nano trenching. The Google microtenching that has been abandoned was a “trial” where they buried the cable/duct only 50mm deep instead of the more usual 100mm. The areas where it is buried 100mm (or 4″ if you are stuck in the 18th century) are all fine. This is a good idea until you realise that some of the original phone cables are barely buried at all. They’ll be cutting old lines every time they cross a frontage. Power cables are pretty hard to hit unless you are an idiot. Surprised they don’t blow through a draw cord first,using say micro paracord 1.12mm diameter,very strong would think 150-200mtrs possible through ducting. They don’t use a draw cord as they use blown fibre – using a method BT have the patent on. I’m forced to have Virgin when I don’t want to! I want Openreach to put their proper fibre in and give me that sweet gigabit with low, low ping times! you going to co fund the openreach deployement costs with your community then ? I’m sure those stuck on relatively slow VDSL and indeed ADSL are crying a river for you being stuck on 350Mb cable. have TalkTalk not proved the business case already for microtrenching in York which proves it more cost effective than claimed and less disruptive? 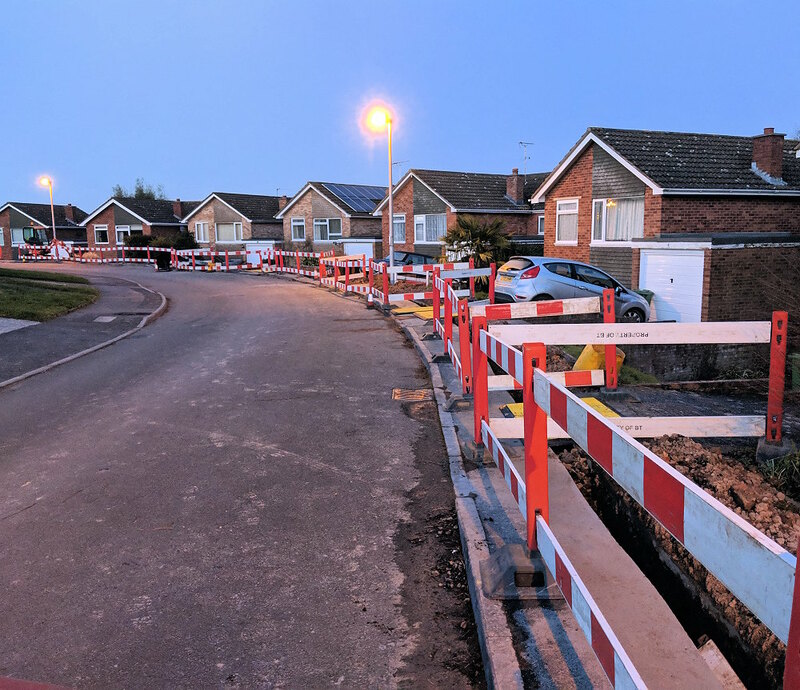 The above trial isn’t so much about proving the business case for “micro trenching” more generally (this has already been used for years), it’s about testing Openreach’s new “micro ducting” approach that has some differences to the usual method. I think OR’s trial will have to cover other things too – with the requirement to offer duct sharing to other operators they’ll need to make sure that can work technically, commercially and in their records systems. If a micro duct doesn’t offer enough room to easily let other operators put their fibres in, it may not be allowed. Talktalk don’t have to do any of that, they can build it and offer service. Duct sharing isn’t relevant as this is dug straight into the ground, there’s no existing duct to leave any space in. @Mark – Aren’t OR saying that this differs from micro trenching in that they are laying a duct, albeit a very small one? More the type of duct from what I can gather. I’m not aware of any deployment that’s putting fibre cable in the ground ‘naked’, always cable in a microduct or blown fibre tube. I was under the impression BT already had duct and footway boxes here it was just that the premises feeds were directly buried. Much will depend whether they can go over VM duct or below it (depending on the depth actually used by VM). OR copper can be detected by oscillator and no doubt they will have a copper team on hand but not sure how easy it is for a third party to trace the VM footway to premise duct/cable. Can’t be any worse than for Cityfibre. OR needs a solution like this for engineering decisions in the past. City Fibre with Vodafone as the ISP partner, trenched a 1GB FTTH pass my front door last year. Very good job they made of it, considering they were not allowed to cut across tree roots and the trench took some weird diversions. Multiple ducts were used, no doubt to support further services. At the moment there is no competition from the likes of BT/OR, so will be interesting to see if there will be any lease or sell off after the initial protected period ceases. You know if you’d examined the photo from the linked article in the 35ft pole story, you’d have worked out that the poles were actually only 20ft tall… Either that or they have 6ft tall wheelie bins on that street! As I live 1/3 of a mile up a country lane and our line is buried. We have a whopping 3.3 Mps speed. This would be a great solution. V unlikely that would be cost effective for them to you. I’d be very much interested in the development of techniques to bring cheaper installation methods for longer rural runs. We have around 2.4km of direct in ground main cable that appears to have been originally installed by the direct in ditch method, with the ditch subsequently silted up (some sections are now direct hung on drystone wall), and then from the manhole 600m of direct in ground feeding just our house. Not without BDUK funding I imagine, especially if there isn’t enough verge to work with while not disturbing traffic too much. If there are loads of properties down that country lane that would help too. If just the one property down a 500m narrow road that’s a difficult one even with BDUK funding. This article makes me laugh. This is not a new method. The dual saw is used in different projects around UK. Is not anything new. The saw is made by Belle. The council’s will not allow to cut that narrow in the SW. They made the contractor cut back to 160mm. Council’s make this projects very very slow. That’s a fact! I will second that. However, all the dual bladed floor saws that we own are from Husqvarna. So there is choice in the market. It is a mark of the lack of innovation in OR and the lack of willingness to experiment with different methodologies that this is being “trialled” at this stage in the game. But that is why OR is where it is. And that is why sticking to orthodoxies never works in businesses that need to innovate. I would like to see if this really will work. I’d imagine it will only be used in estates fed using the DIG (Direct in ground) method. I couldn’t see them using this all over down the main streets where the main lines run. Imagine having to do this every time you want to put a new cable in for services between exchanges. Bare in mind there is at minimum multiple cables between each exchanges within an area. It would prove inefficient if they are constantly putting in new cables to feed between exchanges to deal with capacity. I don’t think Husqvarna makes dual blade floor saws. We have just had Virgin laying fibre all around me which has taken months and is still going on. I assume the council has given permission but why don’t councils say yes but only if other suppliers are given the chance to use the same trench (sharing costs). This saves digging the path up twice, if nobody comes forward that’s it they can not come back at a later date. If openreach are forced to open there ducting and poles to anyone why can’t everyone come under the same rules. Would fibre be available to more people more quickly. I agree with you here. Unfortunately Openreach is the only company that is forced to open up their poles and ducts. And Openreach is the only company with government forced service level agreements. Pretty unfair in my opinion to force this on only one company if they are trying to promote fairness within the competition. You end up with some unintended consequences if you do that James. There’s an issue around the requirement to share causing costs to rise for whoever funds the build – to the point where the investor can no longer make a return; but the primary one is that it actually stops people building network full stop because as soon as they do their competitors will just rent space in the thing they’ve built instead of building themselves. It’s way more attractive financially to just rent space in someone else’s thing – it is way cheaper to do that than to build and the risk reduces to zero – you’d only be renting space if you have an order, so you know you have revenue to cover the cost of the rental. If you build, you might sell some services, you might not. Put simply, where sharing is a requirement – you build, you lose.